This year we recall the Holy Innocents in more ways than one. 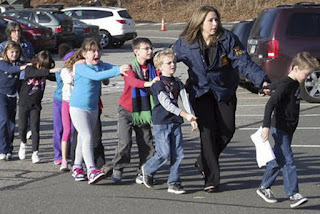 Besides the upcoming feast, I'm thinking of the evil lunatic in nearby Newtown, Conn. who murdered 20 innocent little children in cold blood December 14. I hope the irony wasn't lost on everyone as Obama cried. Everyone is screaming for gun control and how horrible the violence is, yet on January 22 we will have the 40th anniversary of legalized murder by abortion since Roe v Wade was decided in 1973. Over 45 million innocents have been killed. Where are Resident Obama's crocodile tears for them? Oh, I remember, whether or nor pre-born life is human is "above his pay grade." Good thing Lincoln didn't say the same thing about African-Americans. The desensitization to the sacredness of human life has made all these killings possible. Not just violent games and TV/movies, but the toleration of abortion and euthanasia as a "choice." Life is cheap. What message does the Vatican II sect send when Mr. Dolan, the so-called "archbishop" of NY invites Obama to the Al Smith pro-life dinner? What message when Ratzinger calls from the Vatican to "congratulate him" on winning another term of killing children? What message when the so-called "bishop" of Albany gives baby-killer and adulterer Gov Andrew Cuomo "communion" ; the same man who pushed through the"marriage" of sodomites--violence against nature itself. Let's not even discuss what the Vatican II hierarchy has been doing to children themselves. When the hierarchy defected from the Faith during Vatican II, and replaced the Holy Sacrifice and Sacraments with invalid counterfeits, God's Grace has been lessened and we see the results. Their actions speak louder than words. My friends, God will not and has not abandoned His One True Church--we Traditionalists keep Her alive and the grace flowing from the True Mass and Sacraments! You can have a Merry Christmas because, as the name implies, we still have Christ's Mass, and His Real Presence. The National "Catholic" Reporter published an article this month entitled "Attempt to resurrect pre-Vatican II Mass leaves church at crossroads." Written by an invalidly ordained "priest" who is honest enough to just call himself Ron Schmit without the title, he implicitly understands that you can't be Catholic and accept Vatican II. It was curiosity and a sense of irony that moved me to open the Oct. 1 issue of our diocesan newspaper. On the cover was the headline "Moving Forward in Faith" next to a picture of our former bishop vested as would be a prelate from more than 50 years ago. 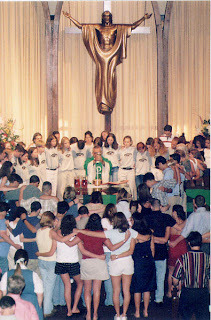 This was a photo from a liturgy in the "extraordinary form" (pre-Vatican II 1962 Latin Mass), welcoming a group of very traditional Carmelite nuns to the diocese. Lately, there seems to be an increasing interest in this "extraordinary form" in our diocesan paper and among some of our clergy. In the past my attitude has been "so what." If people are into antiquarianism, let them. Some people like to spend weekends reenacting the Civil War. They dress in period costume. They stage mock battles of Union and Confederate soldiers. It's a harmless hobby. I just figured that the people attached to this "extraordinary form" were the liturgical version of societies for anachronistic re-enactment. "Assuredly it is a wise and most laudable thing to return in spirit and affection to the sources of the sacred liturgy. For research in this field of study, by tracing it back to its origins, contributes valuable assistance towards a more thorough and careful investigation of the significance of feast-days, and of the meaning of the texts and sacred ceremonies employed on their occasion. But it is neither wise nor laudable to reduce everything to antiquity by every possible device. Thus, to cite some instances, one would be straying from the straight path were he to wish the altar restored to its primitive tableform; were he to want black excluded as a color for the liturgical vestments; were he to forbid the use of sacred images and statues in Churches; were he to order the crucifix so designed that the divine Redeemer's body shows no trace of His cruel sufferings; and lastly were he to disdain and reject polyphonic music or singing in parts, even where it conforms to regulations issued by the Holy See." However, I have come to change my opinion. Those attached to the extraordinary form are not like Civil War re-enactment societies. At least those people know they are play-acting about a time that can never return. The people attached to the extraordinary form are seriously trying to enact a particular worldview and understanding of church. And it is an understanding that we left behind at the Second Vatican Council. It is a worldview that is incompatible with the council. Bravo Ronnnie!! Indeed the Holy Sacrifice is incompatible with the Novus Bogus "Happy Meal" of Vatican II. The understanding of the Church (known as "ecclesiology") is contradictory pre- and post- Vatican II. So much for Ratzinger's "no rupture with the past" and the pseudo-Traditionalists of the SSPX and John Venneri types who think we can read heresy "in light of Tradition." Liturgy is not about taste or aesthetics. It is how the church defines itself. Those who rejected Vatican II and its liturgy were the first to understand the connection between liturgy and our self-understanding as church. The attempt to resurrect and popularize the 1962 pre-Vatican II Mass has serious ramifications. Will we be a church that looks narrowly inward -- where God is found only in piety and private devotion, or will we be a church as Vatican II defined it -- a Spirit-filled people on fire with an urgent sense of mission? We are at a crossroads. The extraordinary form is incapable of activating us as the priestly people of God -- the vision of Vatican II. Which path will we follow? The feisty, joyful perseverance of St. Teresa of Avila is reflected in one of my favorite quotes of hers: "From sour-faced saints and silly devotions, good Lord, preserve us!" Amen. Notice what he refers to as a "silly devotion"; the True Mass which the Council of Trent dogmatically declared in Canon 7: "If anyone says that the ceremonies, vestments, and outward signs which the Catholic Church uses in the celebration of masses, are incentives to impiety rather than stimulants to piety, let him be anathema." You Thought Ratzinger would Appoint a Catholic? That Would Be a Miracle! Ratzinger's #2 Modernist in charge of the Sacred Congregation for the Destruction of What's Left of the Faith is another Anti-Supernaturalist heretic. Here is an except from the blog "Catholic Church Conservation" that summarizes the situation well. Unfortunately, the blogger recognizes the heresy, yet doesn't draw the only logical conclusion, namely, since the True Church can't teach heresy, Ratzinger and his "hierarchy" have no authority and have defected by forming a new and false religious sect. If it would agree with what the Archbishop (sic) Gerhard Ludwig Müller maintains, Christianity would be mocking the audience. 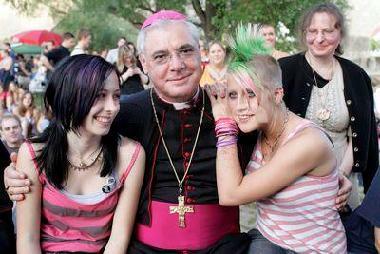 Archbishop (sic) Gerhard Ludwig Müller - the prefect of the Congregation for the Doctrine of the Faith recently appointed by Pope (sic) Benedict XVI - not only has problems with the virginity of Mary, the Eucharist and the doctrine of the Church. In his rambling book "Catholic dogma: to study and practice theology" (4th edition 1995) there are at least three more points that involve serious heresies. On the topic "miracle" Mgr. Müller writes on page 284: " The miracles of Jesus are not to be understood in the context of a definition, which is concerns a 'breaking of the laws of nature'." Such an understanding of miracles according to Msgr. Müller belongs "to the context of a deistic understanding of God and a mechanistic world view." A breaking of the laws of nature is of the essence of miracle. This was already maintained by the preeminent theologian Saint Thomas Aquinas († 1274). In a miracle, God acts directly on the world as first cause . He bypasses thus the secondary causes - that is, the laws of nature. Mons. Müller insulted the Catholic understanding of miracles indiscriminately as "deistic" and "mechanistic". The opposite is true. This is because deism is the doctrine that God created the universe at the beginning and set it going like clockwork, not interfering in its further mechanistic working - neither by miracle nor by revelation. The qualification "deistic" and "mechanistic" hypothesis thus precisely correspond to Mons.Müller's denial of the miracle. Archbishop Müller's inability to understand miracles, influences his dubious statements about the Virginal conception of Jesus and the Resurrection of the dead. In both events, the Bible as well as the tradition of Church sees a classical breaking of the known laws of nature. On page 495 of his Dogmatik, Mons. Müller discusses the virginity of Mary. This, he writes. "This does not mean a departure from the biological norm" . This assertion is related explicitly to the "conception" of Jesus and the virginity of the Virgin Mary before the birth. Mary's virginity during labour Mons. Müller disputes on page 498 of his Dogmatics. There he claims that in the case of Mary's virginity during the birth, is "not" about deviating physiological features in the "natural process of birth." "Not in the context of a biologically exceptional case" On page 497, Mons. Müller closes his remarks on the virginity before birth. He again emphasized: "The meaning of faith in the virginal conception of Jesus by the Holy Spirit does not reveal itself in the context of a biologically exceptional case." Msgr. Müller in his Dogmatik on page 300 comments on the Resurrection of Jesus with this questionable assertion: "The contemporary film camera would have neither recorded the resurrection event [...] nor the Easter appearances of Jesus to his disciples in image and sound ." And on page 303: "Whether the response of women at the grave in the early hours of Easter morning and the discovery that the body of Jesus was no longer there, a historical process in the sense described must not be decided here. 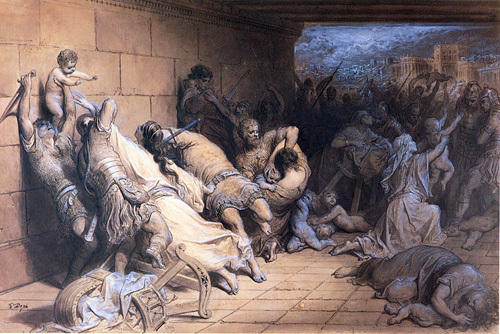 It could also reflect a devotion to the grave by the Jerusalem assembly." On the other hand, writes Msgr. Müller: "In any case, the mighty deed of God must have been implied in Jesus and on the dead body." Because. "A finding of the body of Jesus would have been for the enemies of Jesus, stringent counter-evidence against the identification of God with the eschatological means of salvation" One wonders here: What now? Did Jesus rise bodily or not? Mons. Müller's statements contradict each other. But, given his thesis that Jesus' miracles do not break the laws of nature, he must answer in the negative.